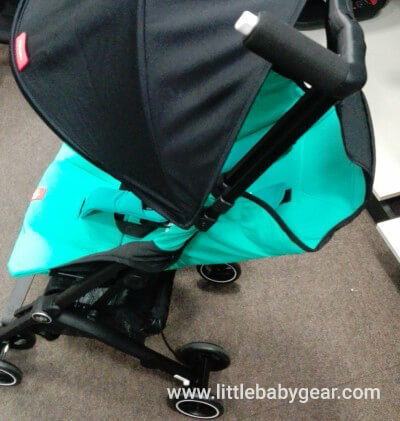 Are you curious about the new features and upgrades of the GB Pockit Plus Stroller? We are all super excited about this new model of GB Pockit+ because it has completely different functions! Moms and dads, I’ve got great news for you: GB Pockit Plus is finally in stores! Probably every parent (and future parent) knows Pockit stroller. Through the last two years it was a HIT and definitely a best seller among lightweight travel strollers. Recently the brand released the new, upgraded model of their iconic stroller – GB Pockit+, which was presented at ABC Kids Expo in Las Vegas in October 2017. The new GB Pockit Plus is available in variety of colors. You can check which versions are currently available and compare their prices on Amazon and on PishPosh Baby. What other parents think about GB Pockit Plus Stroller? Original Pockit was excellent lightweight stroller, designed for parents who are often on the go and travel with their kids, but to be honest it lacks many features that would provide comfort and convenience for parents and children. Although it features light construction and ultra-small fold (that fits in overhead compartment on airplanes), it doesn’t have comfortable seat and proper sunshade. 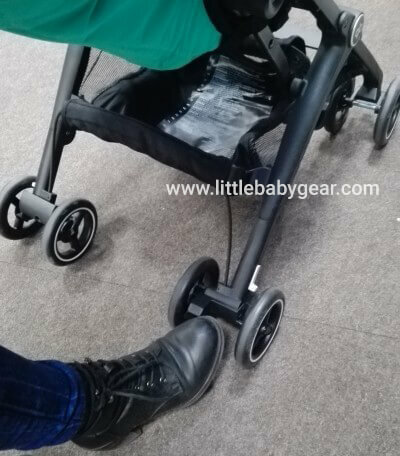 However, the manufacturer has realized (after many parents’ requests) that strolling with baby is not only about moving from point A to point B, but it should be also enjoyable and comfortable for the baby and parent! And that’s how the new GB Pockit Plus Stroller was created. Let’s start with the new features that we all have been waiting for! 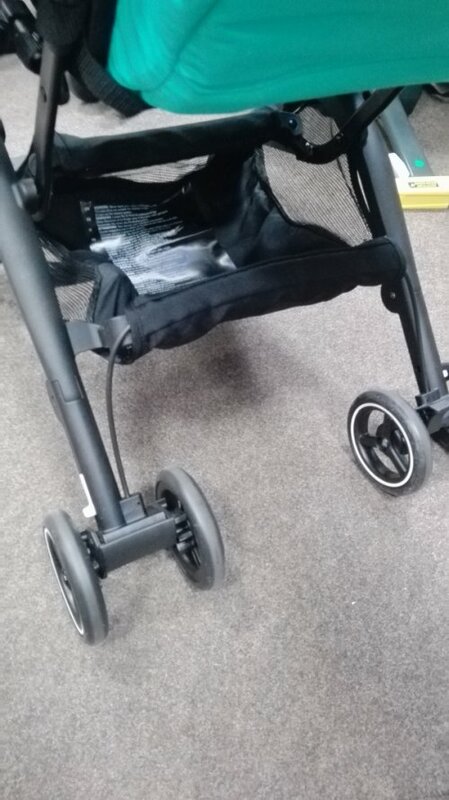 Lack of reclinable backrest was one of parents’ complaints on the previous model of this stroller. The new model has really upgraded and more comfortable seat. The new GB Pockit+ has multi-position recline now. Yay! It doesn’t go all the way down, but as for such a small travel stroller, it’s sufficient. The recline is low enough for comfortable nap on-the-go. In the new version there is a strap which you need to pull to lower the backrest. You can recline it a bit lower by using the additional zipper on the top of the backrest (you can see it in the picture below). The second improvement of the seat is its size. GB Pockit Plus has wider and deeper seat than the older model. It’s really great because thanks to it this stroller can accommodate older and bigger children! I’ve read many parents reviews of original GB Pockit and I found out that some parents use it even for 5 or 6-year-old children (read more here). Now, thanks to more roomy seat preschoolers can feel even more comfortable and even older children can fit in GB Pockit+. Third thing is the seat padding – there is an upgraded neoprene fabric which is really soft and comfy. Original Pockit is suitable only from 6 months, when the baby can sit unassisted and can’t be used for newborns. However, the new model has two options that allow parents to use it for newborns. First of all, GB Pockit Plus is compatible with GB and Cybex infant car seats (with special adapters which are sold separately, for example on Amazon). Parents can easily turn this stroller into a travel system and use it from birth. 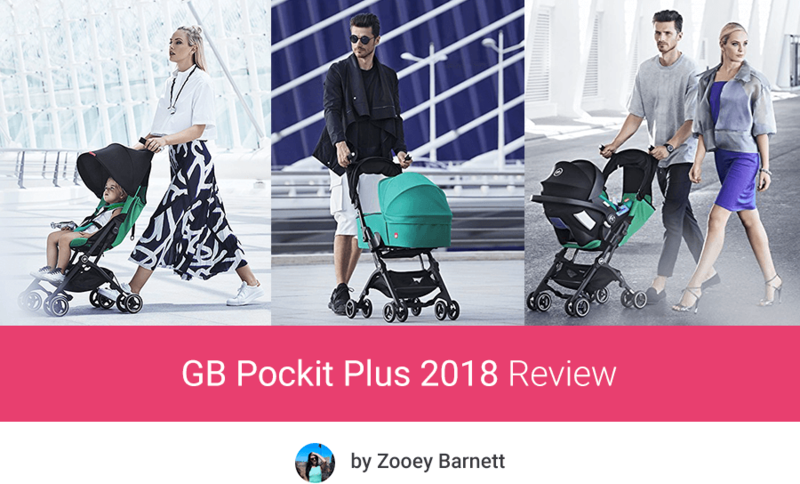 Thanks to this features GB Pockit Plus can be actually the only stroller parents will even need (especially if they don’t plan long strolls with their newborn baby). Of course the infant car seat needs to be purchased separately. The is also another option to accommodate newborn – a carrycot that can be attached to the frame. This piece of gear is also sold separately. Cot To Go is perfect option for parents who would like to travel with their newborn baby or infant who cannot sit yet. It weighs only 9.7 lbs. It’s suitable for babies up to 6 months / 19.8 lbs. 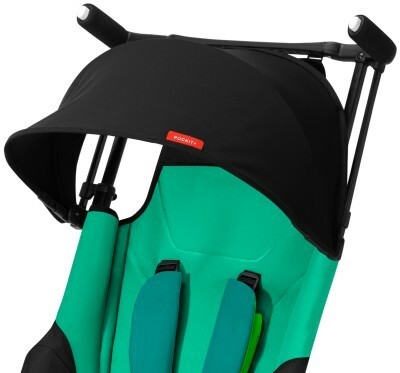 It offers completely flat position which properly supports infant’s back and head. There is softly padded memory foam mattress. It has also good-sized canopy and apron that together protect little baby from sun and wind. With this carrycot parents can use GB Pockit Plus since birth! Traveling with infants has never been easier. This carrycot has one more great feature – just like the stroller it also folds up into super tiny, compact package which easily fits in mom’s handbag or carry-on luggage.Opening and folding takes literally few seconds! Cot To Go is not only compatible with GB Pockit+, but also Qbit+. That’s not all new features! 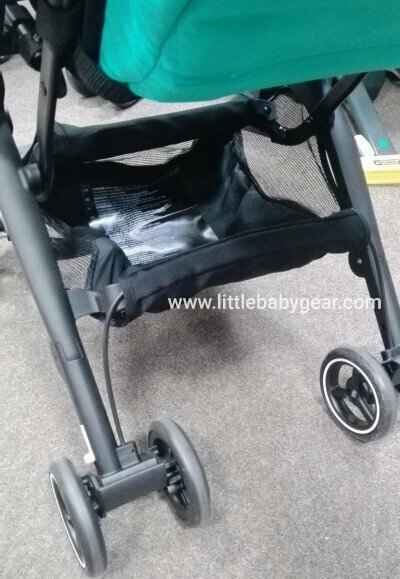 When GB presented their new stroller on ABC Kids Expo 2017 it turned out it has completely different canopy design (although at first the manufacturer wanted to keep the small shade). 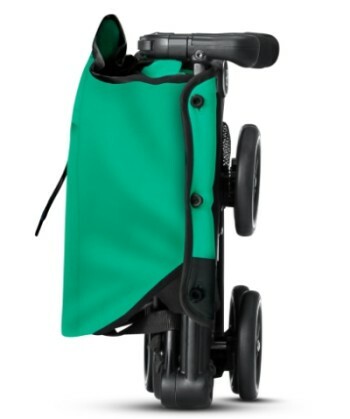 The new GB Pockit Plus stroller has bigger canopy to provide better coverage from the sun, rain and wind. 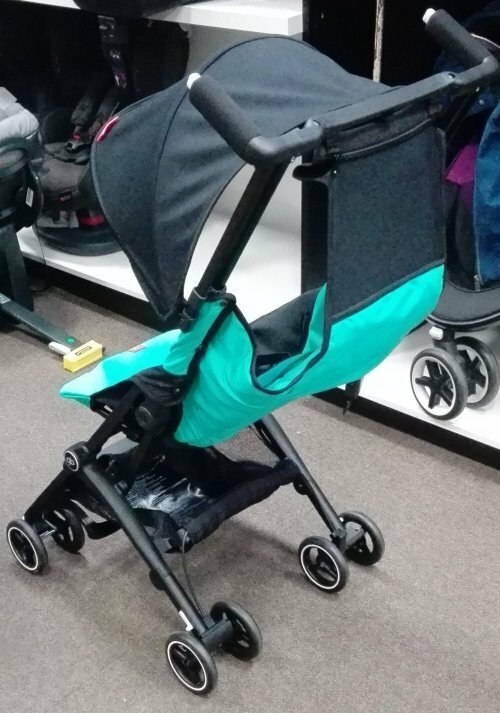 It’s still not the biggest canopy on the market, but it’s significantly bigger than in older model (that one actually doesn’t cover baby at all). The upgraded canopy has rounded shape and at least partially shades the child. It’s made of UPF 50+ fabric that protects baby from harmful sun rays. 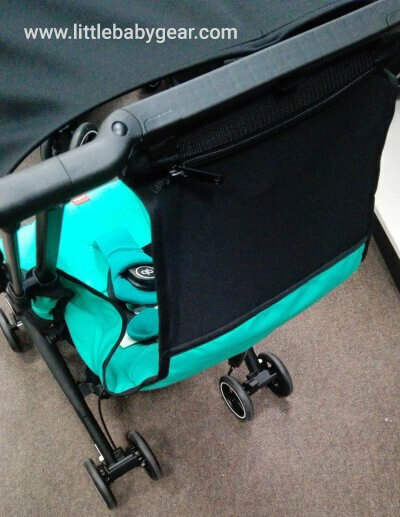 GB Pockit Plus Stroller has completely different sunshade! You are probably wondering if the new GB Pockit+ stroller is bigger and heavier because of these new features. This upgraded model weighs more than original Pockit. The new GB Pockit Plus weight is 13 lbs (instead of 9.5 lbs), so it is a significant change. But it is understandable that the stroller has to be stronger and more robust to hold an infant car seat! However, it is still a lightweight stroller, easy to lift and carry. The size also has change, but don’t worry, it’s only a slight difference. When the stroller is open it’s 1″ wider and 0.5″ higher. Apart from these changes, Pockit Plus remains the same. 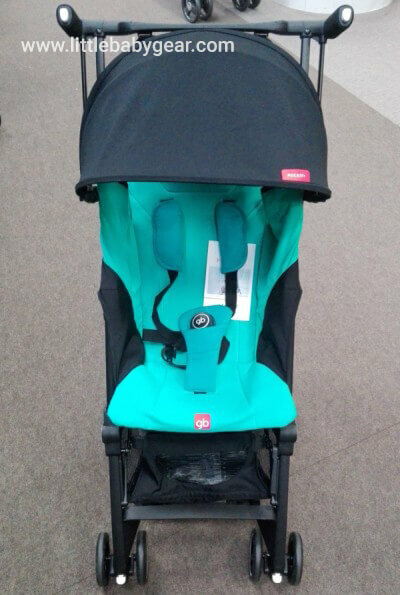 Folding mechanism hasn’t changed and the new GB Pockit+ stroller has also an automatic lock. 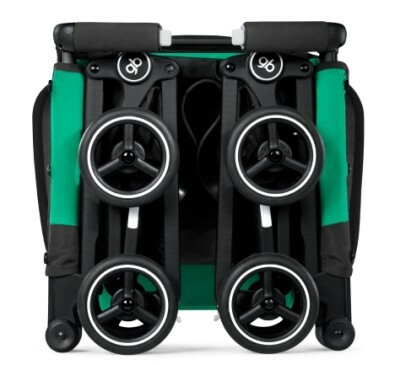 It prevents stroller from opening during storage and transportation. Besides, it stands on its own when folded so you can keep it under the table in a busy restaurant or coffee shop. This space-saver is also perfect for parents who have small apartment or car with a small car trunk (besides, this stroller is so small when folded that you can keep it behind the seat or in your bag!). The new model also has swivel front wheels which can be locked for more rough terrain. However keep in mind, that these wheels are less than 5″ so they can handle flat surfaces, but are not suitable for bumpy terrain. This stroller is so small and easy to maneuver that it can be pushed with one hand! On even terrain it rolls pretty smoothly, but I don’t recommend you using it for off-road cruising. The new GB Pockit+ has two separate handles, just like the older model. According to customers, they are comfortable for short and average in height parents, but they may be too low for a person over 6ft tall. 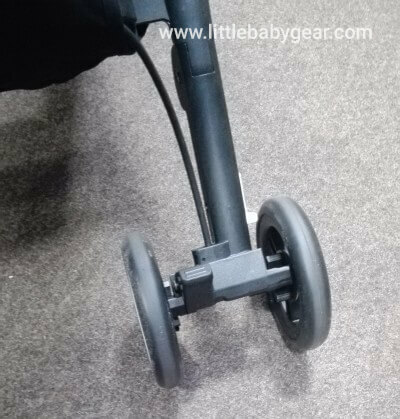 GB Pockit+ stroller has small brake pedal placed between rear dual wheels on the right side. Because of the size and location, this brake is pretty difficult to operate, however it’s something that parents can get used to. I tested this parking brake while wearing winter boots with heels and this tiny pedal was really hard to press – I didn’t feel if I push it properly or not. Disengaging the brake is more easy – you just lift the pedal. I didn’t have any problems with it in my boots, but I’m not sure it would be comfortable in open-toed shoes. There is a storage bin under the seat which can hold up to 11 lbs, however it’s really small so it may accommodate a tiny diaper bag or few baby items put separately (like a blanket, sippy cup, few diapers and some snacks). Good thing about this bin is that it has easy access. These is a 5-point no-rethread harness which can be adjusted as the baby grows (check it in the picture above). The new GB Pockit+ can still accommodate passenger up to 55 lbs. We all have been waiting for this moment! GB Pockit Plus has been finally released on the market! You can check latest price on Amazon or on PishPosh. You can also check if there are any discounts on Amazon for the original GB Pockit by clicking here. I checked this stroller on Amazon to find out what customers think about this new model. It’s getting more and more popular and receives new customer reviews quite often. Original GB Pockit was a best-seller, no wonder the new GB Pockit+ is getting a lot of fans as well. Here is my summary of Amazon customer reviews – features that parents like and dislike the most. As advantage parents mention a bit bigger seat (when compared to previous version) – it fits larger/older kids more comfortably (for example read this review). The canopy finally does the job and blocks off the sun (mainly when the seat is in upright position). Another advantage is the compatibility with infant car seats. Recline function is nice addition, however some parents complain about the mechanism itself and the upright position – which is not very straight (check review #1 or review #2). It’s heavier than original version, but still portable and easy to carry. Tiny fold is perfect for travel – on most airplanes it fits in overhead compartment and under the seat! Moreover, it takes up a little space in car trunk and at home. Nevertheless few customers complains folding is not easy, some say it takes few tries while other say it’s hard and difficult (for example review #1 and review #2). Recommendation from other parents: don’t expect it to fold up and open in few seconds or with one hand. It takes longer, especially at the beginning and definitely requires using both hands. Some parents say it feels sturdier, while other say it’s more wobbly. One of the drawbacks that customers mention is the small storage basket (the same as on original stroller). Folded dimensions 12.5" x 7.8" x 14.9"
The new GB Pockit Plus comes in different colors than the original GB Pockit does. It is available in Satin Black, Laguna Blue, Silver Fox, Cherry Red and Sapphire Blue. Don’t forget to check which colors are currently available! 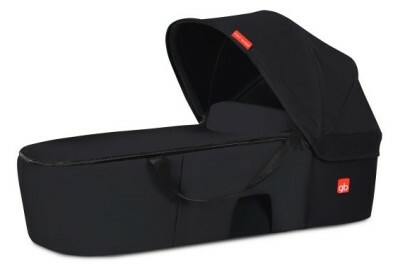 Cot To Go – This new model can be used for newborn baby thanks to compatibility with a carrycot. 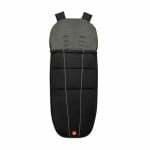 It provides proper support for infant’s back and great protection from the sun and wind. What’s really awesome about this carrycot is that it folds into ultra-compact package which is easy to store (for the next baby) and transport. Now you can have a lightweight stroller for newborn! 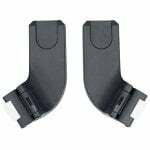 Adapters For Infant Car Seats – GB Pockit Plus Stroller is compatible with GB and CYBEX car seats. You just need these adapters to connect the stroller with the infant car seat. This feature make GB Pockit+ suitable from birth. 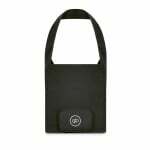 GB Pockit Travel Bag – Thanks to this bag transporting and storing GB Pockit Plus will be even more easy. And you can carry it on a shoulder almost effortlessly, since the new model weighs only about 13 lbs. Footmuff – If you like winter stroller make sure to add this Footmuff to keep your child always warm and cozy, even on chilly days. Below you can see a video from ABC Kids Expo 2017 in Las Vegas, where GB brand presented three models of Pockit: original Pockit, Pockit+ and Pockit Go. You’re probably wondering what is this third model – Pockit Go. Well, it is the same frame than original Pockit has, but without any fabrics, which serves as just infant car seat carrier. As the baby grows up, parents can buy the fabrics additionally. 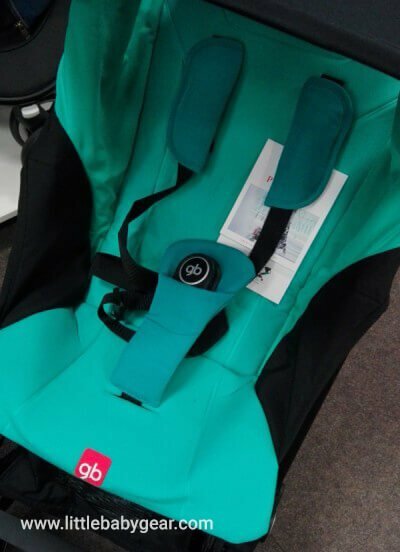 But you can also buy a Pockit+ which is compatible with infant car seats and comes with the seat and all fabrics. As you can see the new model differs from the original version in many ways. Below you can see all the differences between GB Pockit and GB Pockit+. If you want to learn more about the original version here is my review of GB Pockit. Size (L x W x H) 28" x 17.5" x 39.8" 28" x 18.5" x 40.3"
Fold 11.8" x 7.1" x 13.8" 12.5" x 7.8" x 14.9"
The original Pockit was a best seller, although it is rather minimalist stroller. 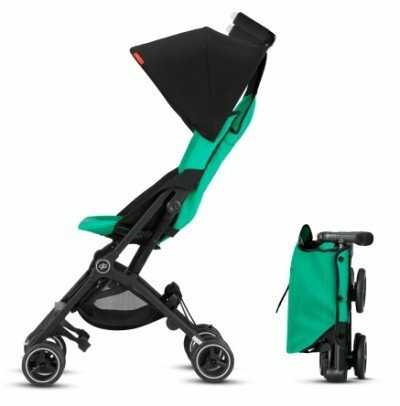 The new model, GB Pockit Plus Stroller is still super compact and small, but additionally it has many features that increase baby’s and parent’s comfort, so I really have a feeling it’ll still be one of the best umbrella strollers for 2019! This stroller works best for travel with baby or everyday use in the city. It’s not suitable for rough terrain or unbeaten roads. 1. It features the tiniest fold in the World which fits in overhead compartment on airplanes and mom’s handbag! 2. With multi-position recline your baby can lie back comfortably and take a nap. And thanks to bigger canopy sun and wind won’t disturb your sleeping child. 3. Thanks to compatibility with infant car seats and Cot To Go carrycot, GB Pockit+ can be used since birth and it can be the only stroller you will ever need. 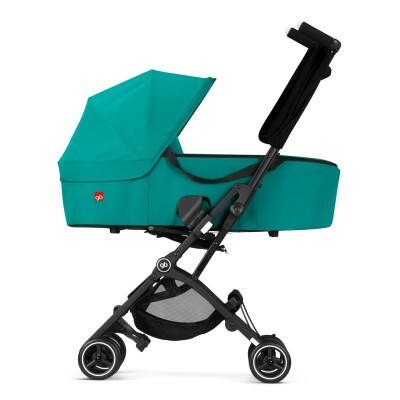 If this stroller is not what you need, here is my ranking of the best lightweight strollers for 2019. You may also want to check my list of other great strollers in 2019. I Hi, I’m reading at Amazon there’s a new version called “Pockit+ All Terrain”? If I go to the normal + page there’s a link the “the new version” with a $20 difference. Any information you can share? It’s confusing since I visited GB’s web page and now some of their models have the “All Terrain” name. For 2019 GB offers two versions of Pockit Plus stroller: all-terrain and all-city (I wrote about the latter one here). All-terrain version has dual wheels and it’s basically the same as the GB Pockit Plus 2018. It has a bit different colors. All-city model has single wheels – this is something completely new for Pockit stroller. According to the brand, dual wheels are better for slightly rough terrain like cobbled streets because they don’t get stuck between stones. On the other hand, all-city single wheels are better for flat pavement. That’s why in 2019 one model is called all-terrain and the other one is all-city. Keep in mind, that the wheels on all-terrain are still small and the name doesn’t mean it will work on dirt roads etc. 🙂 I think GB has added “all-terrain” just to distinguish this model from the model with single wheels. I know I am asking a lot, but I need for them to make a double stroller!!! Please pass this need to the company! I’m trying to decipher the differences between the new GB Pockit Plus, the GB Qbit and the GB Qbit Plus. If you can maybe add the Qbit and Qbit plus to your review that would be AMAZING!!. Generally speaking, Qbit Plus has a few features that make it more comfortable for the baby on longer distances, and more convenient for daily use. Qbit strollers are heavier than Pockit Plus, though still very portable. Folded Qbit and Qbit Plus are bigger than Pockit Plus and may not meet carry-on regulations on many airlines. 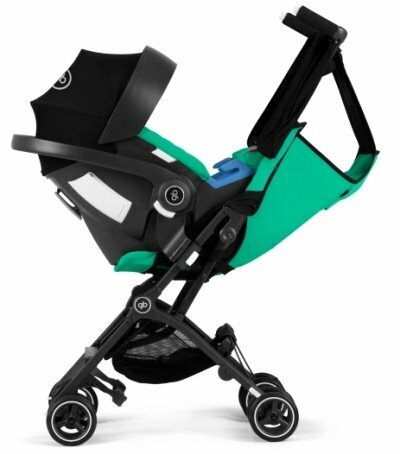 Only the Qbit Plus has deep recline (it’s about 165 degrees) so you can use it as an everyday stroller and the baby can easily take a nap in it. Qbit and Pockit Plus have less impressive recline. 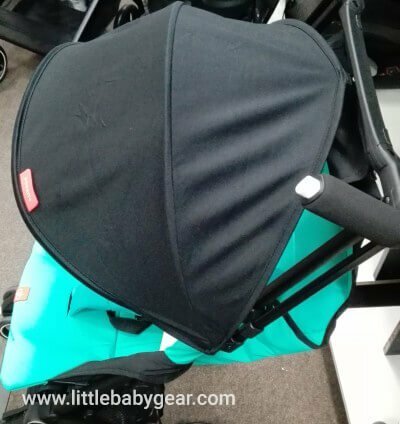 The canopy is bigger on Qbit strollers (original and plus) and it provides much better protection from sun than Pockit Plus canopy. 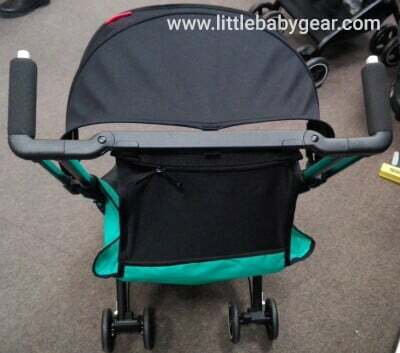 Oh and the canopy on Qbit strollers has peek-a-boo window, which Pockit Plus lacks. 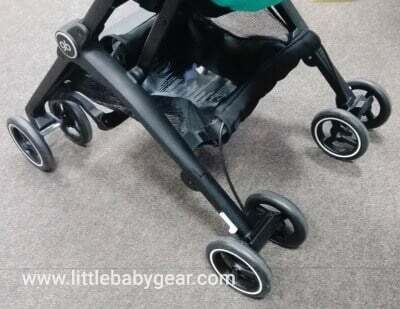 Qbit strollers have also adjustable calf rest for baby’s comfort. Qbit Plus has the biggest wheels among these three strollers (6.5″) so it’s less prone to get stuck on cracked sidewalk etc., Pockit Plus has the smallest wheels (4.75″). 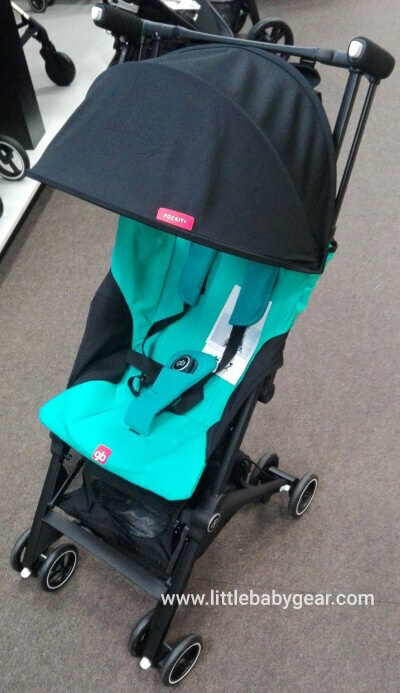 Seats on Qbit strollers are wider, but shorter than on Pockit Plus – which generally works great for tall toddlers. 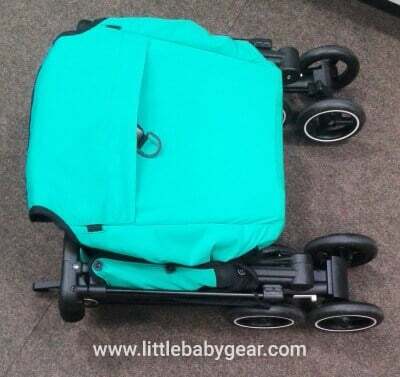 Qbit strollers have also bigger storage basket which makes them more suitable for daily use. On Pockit Plus the basket is really tiny, it doesn’t fit even medium size diaper bag. Do you still have access to the basket underneath when the seat is reclined? With my current lightweight stroller, whenever my daughter is reclined in the seat, I can’t access the basket underneath – really annoying! Would like to be able to put things in and take things out of the basket even if she’s asleep! Hi Allison! I think the basket is quite easily accessible, even when the seat is reclined (I attach here some photos). Of course you need to bend down a little bit to take out your things. Just keep in mind that the basket is not very big, I can fit there my daughter small backpack, but that’s it. Hi, I am going on a cruise, and space is limited, so I’m looking for a compact stroller that can fit in my trunk. This stroller price fits my budget. But I have read reviews about this stroller not being sturdy. 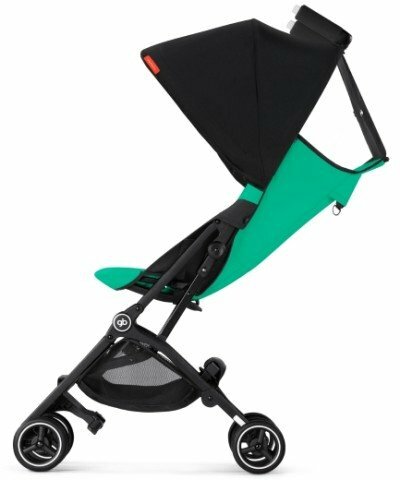 Would you still recommend this stroller over other compact ones? Hi Sarah! When I tried this stroller it felt REALLY light and sometimes I was worried about its sturdiness although I haven’t had any troubles with it. If you’ll stick to the pavement and other smooth and flat surfaces it should work fine. For me it felt sturdy with a kiddo in it actually. Surprisingly the original Pockit felt a bit more sturdy (although it’s even lighter!) and I’ve read many reviews that also confirm that. Have you considered this stroller? Hi womdering if it comes in a double ? I just got this stroller! I love it, but I’m now trying to find a backpack that would fit this. I plan on carrying it while walking with my 2 year old until he gets tired and needs to use the stroller. Have you found any bags this could fit in? Thank you! Debating about returning this stroller and getting the first gen.
Hi Erika! GB Pockit Plus should fit in backpack that is approved as carry on, for example this model and basically every other backpack that is bigger than 12.5″ x 7.8″ x 14.9″. There is also a travel bag for Pockit (this one) but you can only carry it on your shoulder. Does the fabric of the seat still completely snap off? For washing or for decreasing wear and weight while using it with and infant seat. Hi, any information when this new pockit with bigger canopy will available in Indonesia? Thanks. Will the carry cot be available for sale anytime soon? according to the latest information it is expected to launch in February. Hi. I’m cuurently using the cuurent pockit+. Is it possible for me to upgrade the canopy for the current pockit + which I have now?? Hi Hilme! I’m not sure if the bigger canopy will be sold separately – there are no official information about it. I guess we have to wait until the upgraded Pockit Plus will be available for sale. I’ve read your comments & I wonder if in France it could be in the same for the end of fall/ begginning of spring? I pre-ordered mine end of December (on the web) and supposed to receive it tomorrow (France) following thacking number. The price will be about $280-$300, there’s no conformation yet. GB had stated this stroller’s release date was pushed back to Spring this year, earliest being March 2018. Have you heard differently? I am tempted to purchase the first edition as my third baby is due before then. But I would much prefer the new upgraded model! Yes, I have read that it’s scheduled for March/April for UK and February for the US. I’m getting a little bit impatient 🙁 I prefer the new model too, as GB finally made the canopy more useful. Thanks Zooey! I really do hope it comes out soon. Yes, the canopy and reclining options will be worth the wait, I’m sure! Is there a raincover for the new version? I will let you know if it changes.